Due to an emergency water main repair, a portion of the Johnston East water distribution system will be fed with chloraminated water today (Monday) through Wednesday. Customers on kidney dialysis or with tropical fish should be aware of the modified water supply. This will affect the Princeton-Kenly Water District, Little River South Water District, Brogden Water District, Southeast Lowgrounds Water District, Ingrams Water District, Meadow Water District, Town of Princeton and Town of Four Oaks and areas indicated in blue on the map. The water supply to these areas is typically chlorine only, but ammonia will be added to the system for disinfection under the emergency supply conditions. Most customers will not notice a difference in their water. 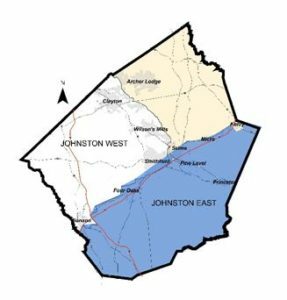 Johnston County will also conduct flushing of the Johnston East water distribution system after the necessary repairs are completed. The flushing process may result in some minor and temporary discoloration of water that does not affect water quality. If you have any questions, contact the Johnston County Department of Public Utilities at 919-989-5075.